Sponsored by At-large Councilwoman Megan Barry and District 6 Councilman Mike Jameson, the resolution would require builders to include a required number of trees in their residential developments. Metro already has a tree ordinance pertaining to commercial development, dating back to the 1990s. 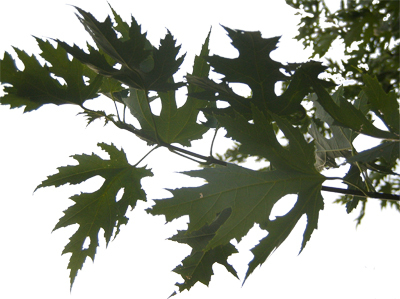 Residential areas were excluded from that resolution, but a study by the Metro Tree Advisory Committee, completed in May, said Davidson County’s tree canopy was too low. The proposed resolution would require new residential developments to plant or maintain a certain number of trees. We moved into a new neighborhood 12 years ago in southwestern Davidson County, also know as Bellevue. The developer, Fox Ridge Homes, planted a Bradford pear in the front yard and a dying tree in our back yard. Our Bradford pear died in the July heat shortly after we closed on the house in late June. I asked the agent for Fox Ridge to replace it with a tulip poplar, and I was told that I had to replace it myself with a Bradford pear. I refused and later planted a silver maple. Luckily, the silver maple has prospered. We have some shade from the afternoon sun. Meanwhile, many of the Bradford pears, planted in the neighborhood, also prospered. I sneezed heavily each spring during the snowstorm of blooms which blew off the trees. Unfortunately, last year many of the trees split during wind storms. One Friday afternoon, I counted seven split trees, when I returned from work. And the trees continue to split. Recently, I was blogging on a Sunday afternoon and heard a whish sound from the street. One of the Bradford pears in the yard across the street from us split. There was no breeze. I rushed outside and the neighbor joked that my cat had pushed the tree causing it to split. Let’s support this tree density ordinance, but let’s enforce that native trees be planted. Please email your Metro Councilperson NOW in support of this ordinance. 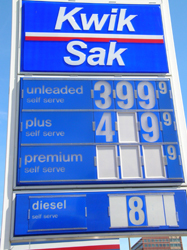 I’m very aware that during the Nashville gas crisis that there is a global financial crisis happening. 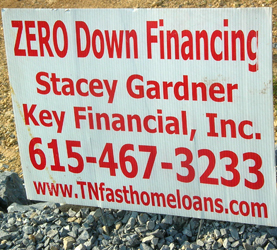 Recently I visited an abandoned development in the Riverwalk subdivision and found this sign promoting ZERO down financing. I love the URL, www.TNfasthomeloans.com. I’m not calling. I’m paying down my 15-year fixed rate mortgage as fast as I can. The website is still working. Enter at your own risk. 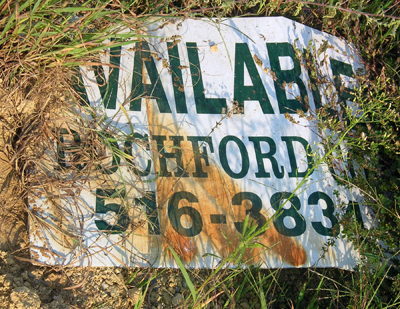 If you have bad credit, you still need a down payment according to the site. Why I had no idea that Purity Dairies bottled All Natural Tea! I learn a lot of things when I walk upon other folks’ trash. Bottled tea to me is like bottled water. Why? Southerners always have a pitcher of tea handy. P.S. 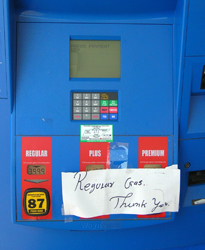 The gas crisis has become mundane. I’m down to 2/5 of a tank. 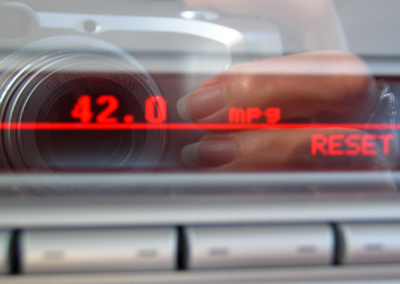 I’ll have to buy around Sunday — two weeks after I last filled the tank. I hope my Mini likes regular.